Japanese culinary art is not just unique but is a fine mix of tools and recipe. Demystifying Japanese cuisine requires adept understanding of their broad assortment of knives. These knives have so many distinct designs and the blade type differs widely. The fine quality of knives is the centre of many global chefs too. Some cooks are diehard fan of Japanese knife because they have super sharp edges, light weight and are widely available. Best Japanese knives are also preferred over European knives for a variety of reasons. Razor sharp, light weight and balanced, Japanese knives are perhaps everyone’s favorite. Ranging from broad to thin, large to small; there is a knife for every task. Crafted from harder steel, it offers lasting durability. Truly inspired by the Damascus tradition of sword making, these knives are a must have in your kitchen selection. There are a variety of Japanese knives and each of them is having their own features and advantages of use. Let’s have a cursory glance at some of the common knife types. Chukabocho: It is a rectangular shaped larger knife with thin blade. It is used in general kitchen to cut vegetables. Deba: This one is thick, heavy and is used to chop fish. It can be used as a multi functional tool such as used for cutting meat and butchering poultry, but cutting bones might spoil the sharpness; its use is not recommended. Ai-Deba: This knife is lighter than Deba and its spine thickness is same as Miroshi Deba which is also a Japanese knife. 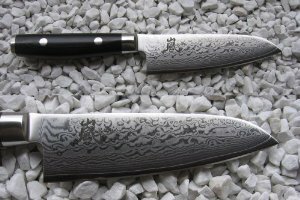 Atsu Deba: In Japanese language Atsu means heavy or thick and Atsu Deba knives are for rough use. Santoku: It’s the Japanese version of the general utility knife. It’s popular worldwide and the perhaps the one of the best Japanese knives one can use. Japanese knives are well known for their design and functionality. You will swear by their performance once you use them. Light weight: Japanese knives are lighter than other knives resulting in quicker cutting and less strain on hands. They are more balanced and give a good grip. Precision: They are capable of cutting very thin slices and also make your job perfect. If you are a cook who looks forward to perfect dicing and slicing tasks, you should own one Japanese knife. Design: They have a unique design and have the Japanese style in them. 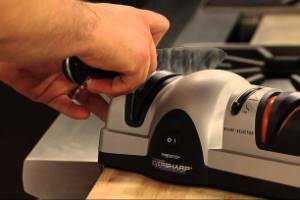 Sharpness: Nothing beats the Japanese knives when it comes to sharpness. They are razor edged and glide smoothly and makes cutting hassle free. 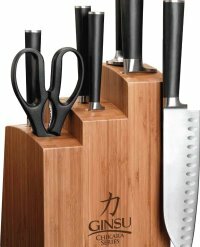 Where to buy Japanese knives? Best Japanese knives can last for more than ten years. These are easily available in your local stores; or any other reliable online manufacture or retailer. 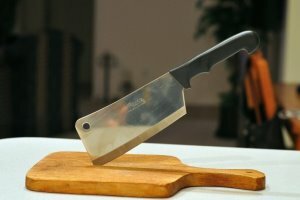 Let’s have a heads up at some of the popular Japanese knives available in the market. 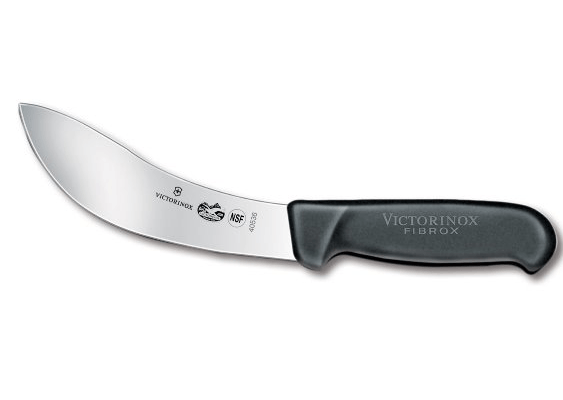 It is a multipurpose knife which is excellent for both slicing and chopping (vegetables & meat). It has Tsuchime hand hammered finish which makes the blade more striking. 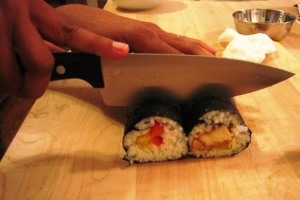 This handmade feature also reduces the drag when we cut it in pieces and also prevents food from sticking on the knife. The handle is made from the premium quality pakkawood and you can comfortably grab the handle while cutting, chopping and slicing without letting it slip from your hand. This Japanese knife is perfect for slicing, chopping, dicing and mincing. Its stainless steel blade with scalloped edge makes it a perfect accessory in your kitchen. The major feature is that it has sixteen layers of stainless steel to create a Damascus look. It is durable and very comfortable to use and also looks very elegant. It comes with a lifetime warranty and is manufactured in Japan. This means you get best knife straightaway from the Japan to your kitchens. It is also rust free and never loses its Damascus elegance. Looks extremely good in the kitchen where people love to cook food and experiment in the kitchen. 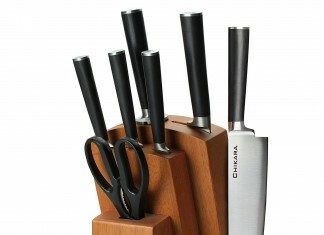 This set is ideal for slice, chop and cut up because these are specialized for handiness. It has traditional Japanese design and is made from high quality material to keep it water resistant, heat resistant and full tang. It has incredible sharp edges which are rust proof. This product comes with limited warranted and hand wash is recommended. This knife looks like an ordinary kitchen knife, but is powerful with 8 inch long stainless steel blade. 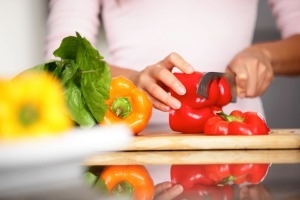 It is ideal for kitchen use to chop and dice vegetables and fruits. It can also slice fish with its long slender blade. It is for right hand use and is very comfortable in using. It can be a perfect addition in your collection because small, but effective knives are also required. It is durable and going to help you in kitchen for a very long period of time without any discomfort. It has sixteen layers of hammered VG-10 Damascus appearance. Its blade is rust proof because of stainless steel blade. 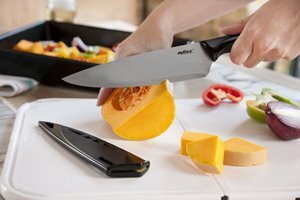 It has double edge blade which makes chopping, slicing etc very comfortable without straining your hands. It has Mahogany handle and has very good hardness which makes it durable. The size of the knife is 8-Inch and is perfect addition in your knives collection. It also illuminate darker picture of blade due to light conditions. 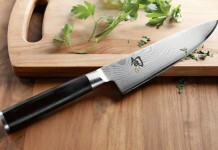 Best Japanese knives are not just popular among chefs, but cooking lovers all around the world. These knives are made from very high quality blade and wood for handle. These knives are available at best price online with plenty of discounts. You can definitely find your pick here.